Pet parents often ask which digestive supplement is right for their pet. Digestive Support? Papaya Support? Both? 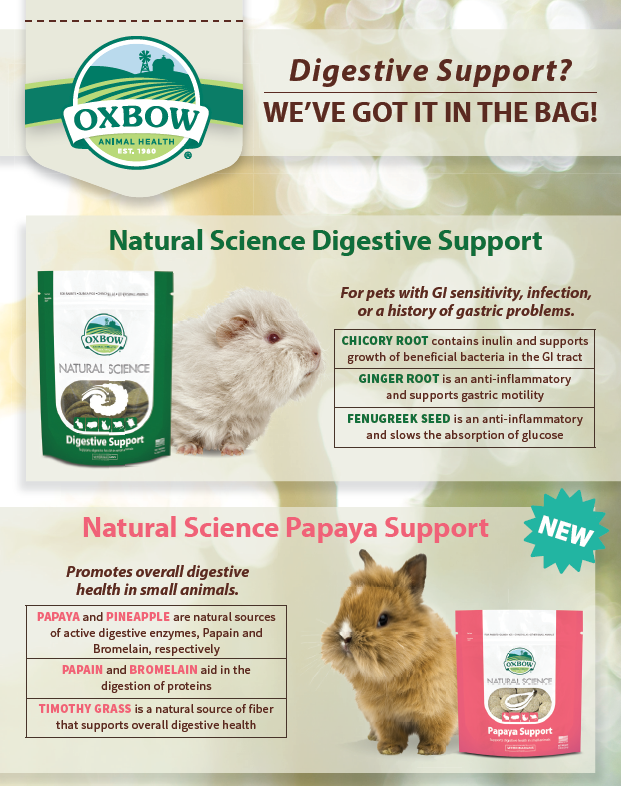 The reality is that both of Natural Science Digestive Support and Papaya Support can work together to synergistically support digestive health in rabbits, guinea pigs, chinchillas, and other small pets. Some pet parents may find that one of these supplements provides the right amount of support for their pet, while others may find that offering both products simultaneously provides an ideal level of digestive support. Natural Science Digestive Support is custom formulated for pets with GI sensitivity infection or a history of gastric problems. Key ingredients include chicory root, ginger root, and fenugreek seed. Papaya Support promotes overall digestive health in small animals with the aid of ingredients such as papaya, pineapple, papain, bromelain, and timothy grass. It’s important for all pet parents to remember that no supplement is intended as a cure or stand-alone treatment for any specific illness or disease. Always be sure to consult your veterinarian before adding supplements to your pet’s diet, and always follow specific product directions. Happy Digestive Health to all of our furry friends! My bunny LuLu sneezes a lot around hay. Can she be allergic to the hay? This happens a lot every day. Hello! Just like their human counterparts, rabbits may experience allergies but in my experience, we don’t see true allergies in exotic companion mammals as often as other species like dogs. I would recommend trying a different variety of hay to see if there is any change, but remember that you need to take some time between changes to truly validate if it makes a difference. Also, we know that hays naturally vary in terms of their moisture which would, in turn, have some impact on the dust the hay naturally produces as it is handled. I have had some owners try to open the box of hay outside and fluff it up gently before moving it to a plastic storage container and back inside. I have also heard of very lightly misting the hay prior to feeding to keep the dust down if that is what we feel is truly your little one’s sensitivity. I’d also recommend looking at Oxbow’s Harvest Stacks. They’re compressed hay stacks that contain less dust. This may help your little one. Lastly, I would work with your veterinarian to complete a thorough physical examination that should likely include an in-depth oral examination and potentially nasal rads. 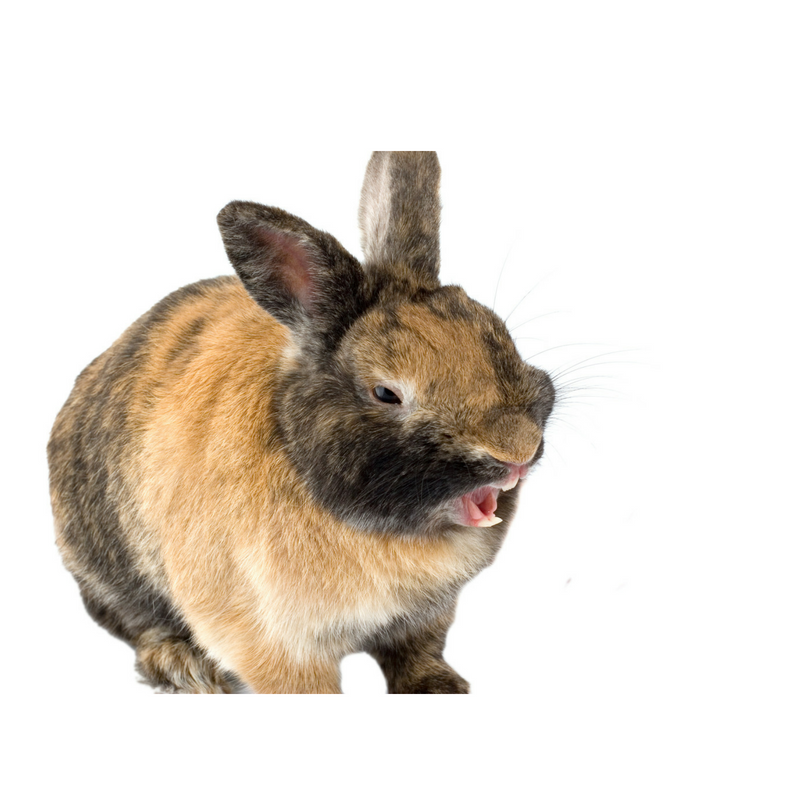 Upper airway disease, which commonly leads to sneezing as rabbit are obligate nasal breathers, is sadly quite common and often associated with a bacterial infection. The common term for this is snuffles but it can mean a variety of things. Hopefully, some of that information helps! Oxbow's Academic Scholarships award annual financial support to five outstanding students pursuing education in the exotic and companion animal veterinary fields. Oxbow scholarship winners are chosen for interest and involvement in the field of exotic animal health, excellence in the areas of academic achievement, and expression of future career goals and interests.